DBZ, or DragonBall Z, is one of the longest running animated series ever. The story centers around the main character Goku. Goku and his friends train very hard and battle evil villans that try to destroy them. But these aren't any normal fighters, but they recieved special training from their masters that enables them to have special powers. Many of them can fly through the air by focusing their energy, or "Ki". They can use this Ki to also make small spheres of energy and throw them at an enemy. They can move so fast that an untrained eye could not see thier movements. Many of the characters are humans from Earth. However, Goku, and other characters are part of an alien race called the Saiyans. The story of the Saiyan goes back many many years. To a planet called Vegeta. The Saiyans were mostly like pilagers and mercaneris. Traveling accross the galaxy destroying all life on a planet, then selling the planet to dealers and people of high rank like Freeza. 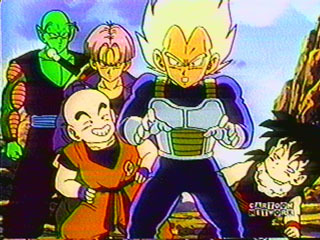 Then, the saiyans began to get stronger, and they all decided to rebel one infamous day. Along with a small army, King Vegeta and a small army invaded Frieza's ship. When they got to Frieza, King Vegeta attacked. But, lost. Soon after, Planet Vegeta was destroyed by the infamous Freeza after he considered the Saiyans a threat. Every Saiyan was wiped out except for the lucky ones who managed to be off the planet at the time. Now, with only a few left, they struggle for survival. They are scattered among the galaxy still destroying with the same fearsome attitude for living things. The most distinguishing part of a Saiyan is a tail usually wrapped around the waist. It is wrapped around the waste because it is EXTREMELY painful to a Saiyan if it is grabbed, squeezed, or stomped. Although most advanced Saiyans have taught themselves to be immune to the pain, it is still, if any, a weak point of a Saiyan. All Saiyans have black hair and black eye brows. Every Saiyan has the traditional battle armor. It is high quality armor that is almost unbreakable but to the strongest foes. Long protruding shoulder gountles and chest plates make it somewhat heavy. The armor is usually accompinied by either blue sleeves or bare arms with white gloves and boots. Every Saiyan is also equipped with a "scouter". A scouter is used for locating power sources, food, and almost everything. It also has the ability to read a beings power level. The scouter is also a transmitter to relay messages back and forth. Special abilities Saiyans are EXTREMELY powerful and smart. Saiyans usually have an IPL (internal power level) or KI of around 2000-10,000. Saiyans are unforgiving and ruthless in a fight. NEVER will a Saiyan ever back out of a fight unless told to by a higher rank or killed. Usually a Saiyan is never out powered or in need of mercy. But incase all odds are against him he has a special trick up his sleeve. Saiyans' tails arn't just there for show, they give them the ability to transform into an unstoppable monster at the light of a full moon. Fortunatly, for them, a Saiyan named Bardock, who was the father of the Saiyan Kakkoroto, developed an ability called Oozaru Light. 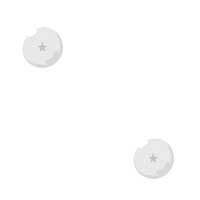 By creating an energy ball that simulates the light of the full moon, they can transform at will. Why they dont transform for every battle? It is because it is considered dishonorable to transform to beat an opponent. The Super Saiyan There is something known as a SUPER SAIYAN. 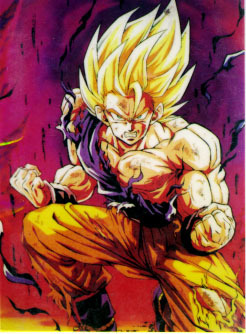 A Super Saiyan is a being that supposedly comes around every 1000 years, and Kakkoroto, a.k.a. Goku, was supposedly it. 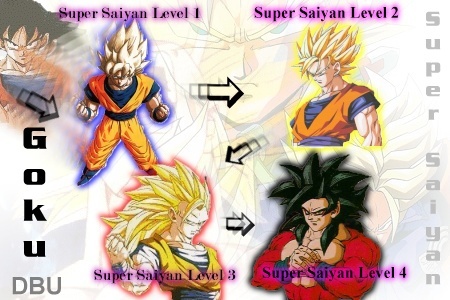 Yet, Gohan, Goten, Vegeta and Trunks all seem to reach Super Saiyan level. A Saiyan's power and fighing skill increase as he fights. The more they fight, the more powerful they become. In order to become a Super Saiyan, a Saiyan must strive to push his max power level. It has to be a power level well above any other normal Saiyan. When this level is reached, he must have a pure heart in order to change to Super Saiyan. Then a Saiyan will undergo a metamorphisis set off by exteme rage. When a Saiyan reaches Super Saiyan level, almost everything changes, facial apperence, speed, power, sences, everything about him changes. He is almost...UNSTOPPABLE! 1. First is what is known as a Super Saiya-Jin level 1. The actuall Super Saiyan. The Super Siayan has a yellow glow that surrounds his body. This level of Super Saiyan is achieved by extreme anger pushing the power up so high characteristics change and power increases MANY times. This is the level of Super Saiyan level. 2. Second is the SSJ2 or Super Saiya-Jin 2. This level turns the hair a more golden color, and it spikes out more. There are more strands of hair. The power level shoots quite aways up too. 3. The third transformation: the power level is the highest than ever, and they are more vicious and zealous than ever before. The most noticable change in SSJ3 is the long, sleek, yellow hair. The eye brows are also gone, making the SSJ3 look more merciless. The only down side to SSJ3 is that it consumes a lot of power. A saiyan cannot hold SSJ3 status long. Once their energy is dispelled, they will be transformed back into a normal Saiyan. The power drain is so tremence that not even resting will restore their power. They must re-aquire the power through training. 4. The final transformation of a Saiyan is SSJ4! This is the most powerful form of a Saiyan. SO powerful infact that their hair turns back to black, and their tails grow back. It disapears after the first transformation of SSJ1. The tail also turns to a shade of red. The Saiyan is unstoppable. Also, the SSJ4 can transform into the Oozaru again. Only this time, it is a Golden Oozaru. 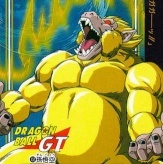 Golden Oozaru is in some cases the SSJ4. 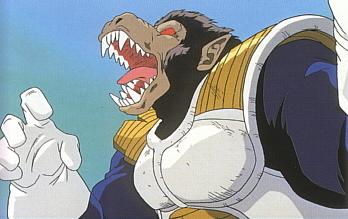 When Saiyans turn from SSJ3 to SSJ4, they go right from SSJ3 to the Golden Oozaru form. Then, once they turn back, they have the appearance of SSJ4 above.